IIS is required to run Portals and InterConnect. 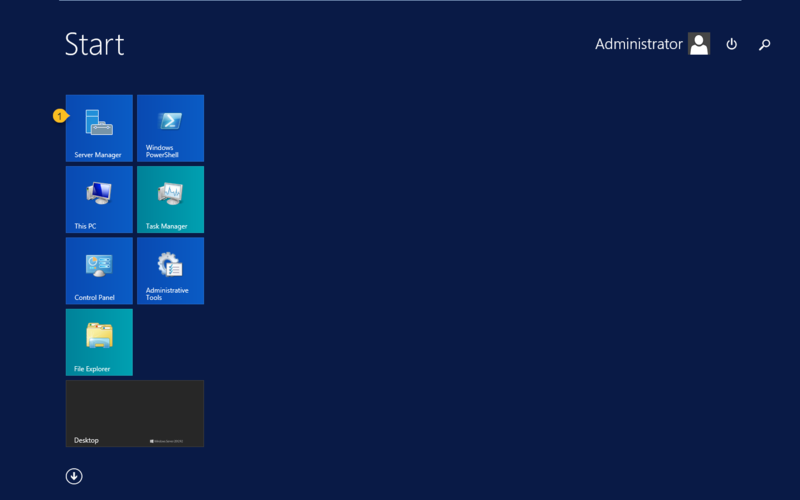 Navigate to the Server Manager via the Start Menu or press the Server Manager icon on the Windows Taskbar. Expand the Roles node in the left pane. If Web Server (IIS) is not in the list then proceed to install it. Additional technical requirements may be needed, as outlined by Typical Hardware/Software Requirements. 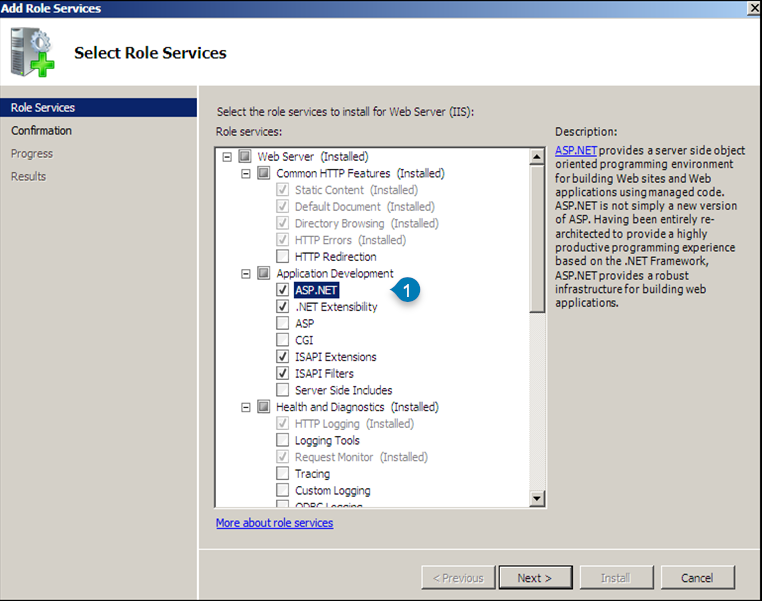 Right-click on Web Server (IIS) in the left pane and select Add Role Services. Check the ASP.Net option in the Application Development section as shown in the screenshot below. A popup window will indicate that the .Net Extensibility, ISAP Extensions and ISAPI filter role services must also be installed. Press Add Required Role Services to proceed. Upon return to the Select Role Service screen, the required options will be checked (see the screenshot below). Place a check-mark in all required Application Development roles. 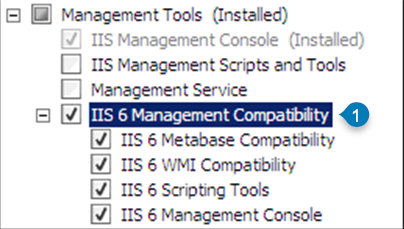 Scroll down the list and check IIS 6 Management Compatibility (see below). Press Next to proceed to the confirmation screen shown below. A summary of installed modules will be displayed. Press Install to finish the installation. After the installation has completed, close the window and reboot the server if prompted. 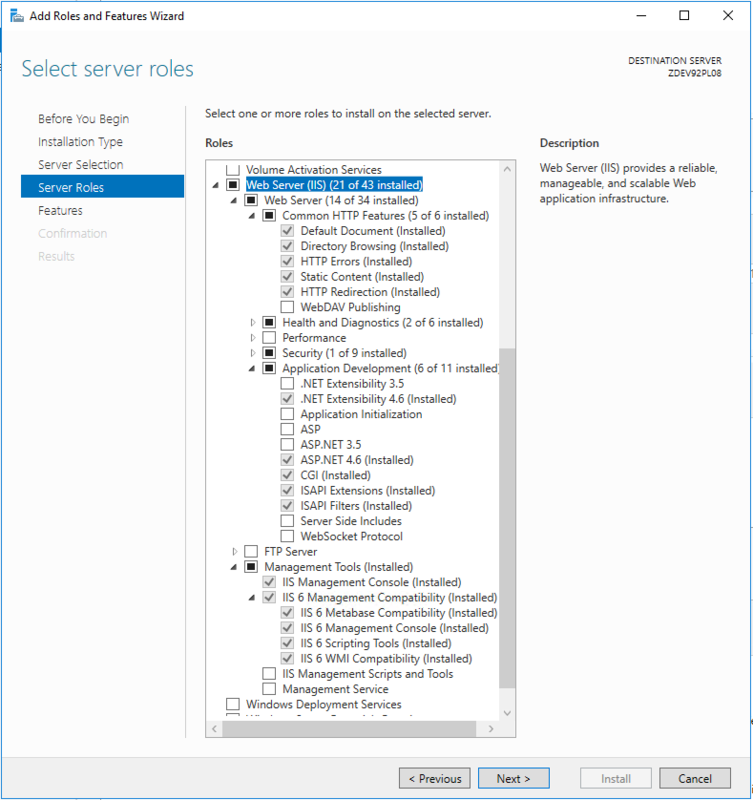 After IIS configuration has been completed, installation using Portal installers can proceed. Navigate to the Server Manager via the Start Menu or click the Server Manager icon on the Windows Taskbar. Scroll to the Roles and Features section in the left pane. If Web Server (IIS) is not in the list then proceed to install it. 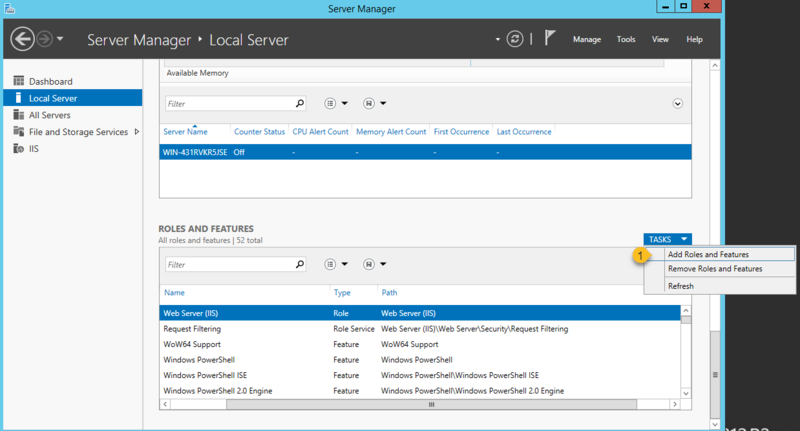 Open Local Server and view Roles and Features pane. 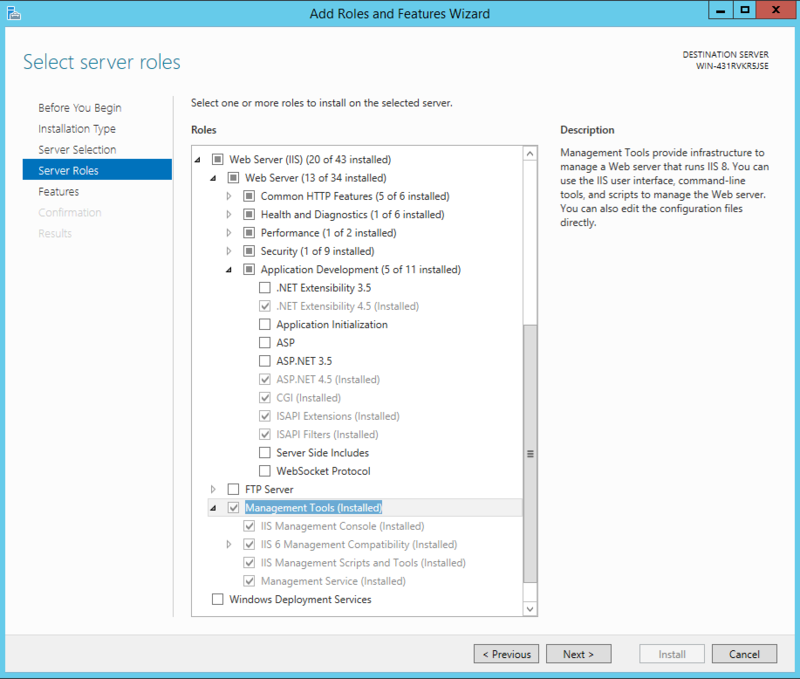 Once Web Server (IIS) has been added to the left pane, roles need to be added. Use the TASKS drop-down to select Add Roles and Features. On the upper-right of Roles and Features, press the Tasks drop-down. Select Add Roles and Features. In the Add Roles and Features Wizard, select the appropriate options until you reach the Server Roles screen. From here, expand out Web Server (IIS) and select the following options. Install any new options. Web Server - the following options are required, others may be added if desired. Common HTTP Features - select everything except WebDAV Publishing (this may be installed if desired). .NET Extensibility 4.5 - version 3.5 may also be selected but is not required. ASP.NET 4.5 - version 3.5 may also be selected but is not required. See the selected options in the screenshot below. Select all of the checked options. Other options may also be included, if desired. Continue to the Features section. If not already installed, install ASP.Net 3.5 and ASP.Net 4.5. 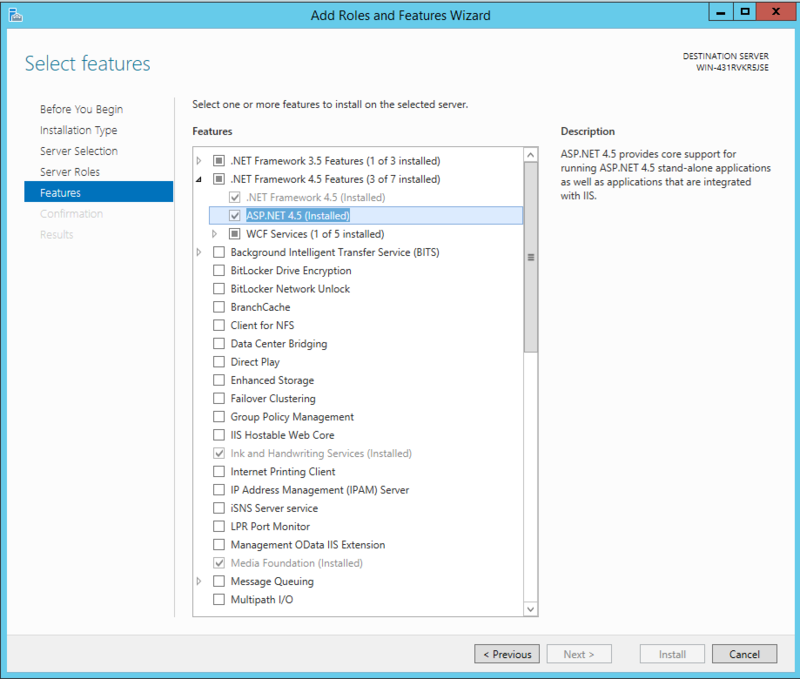 Select ASP.NET 3.5 and ASP.NET 4.5 and install them both. Confirm and complete the installation. After the installation has been completed, close the window and reboot the server. You can do so using the iisrestart command. 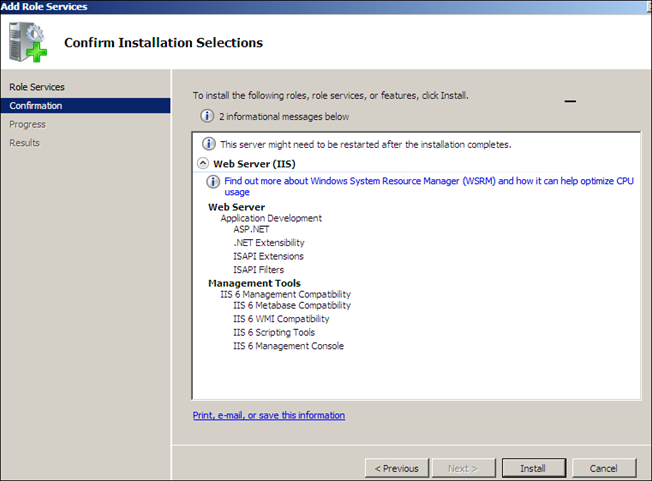 After IIS configuration has been completed, installation using the Portal installers can proceed.